Europe has recently experienced a major refugee crisis. The total number of individuals with recognised refugee status who reside in EU15 countries increased from approximately 1 million in 2014 to more than 1.8 million in 2016. Over the same three years, the total number of asylum applications received by EU15 countries reached an unprecedented figure of 2.6 million (UNHCR 2017). A substantial fraction of these claims is still being assessed. This sudden and unprecedented increase in asylum seekers entering Europe has put concerns about the successful integration of refugees at the centre of the current economic and political debate. One crucial aspect of this debate is the extent to which Western countries can effectively integrate asylum seekers into their labour markets and societies (Fernández-Huertas Moraga and Rapoport 2015, Hatton 2017). Despite the policy relevance, existing research on refugee integration is in fact limited, further hindered because of scarce data that allow the explicit differentiation of immigrants by entry category. Nevertheless, evidence from North America and selected European countries (e.g. Cortes 2004, Bevelander and Pendakur 2014, Bratsberg et al. 2014, Dustmann et al. 2017) hints at a large initial labour market disadvantage, but one that tends to shrink over time. In a recent paper, we analyse the labour market performance of refugees vis-à-vis comparable migrants across several EU countries and over time, and we investigate the role played by asylum-related policies in shaping refugees’ integration process (Fasani et al. 2018).1 We employ recently-released data for several EU countries which contain information about the main reason for migration, thus allowing us to distinguish between refugees and other migrants.2 The repeated cross-sectional nature of the data allows us to observe different random samples of the same immigrant cohorts at two different points in time, thereby expanding the existing knowledge on refugee integration dynamics. We find a large and significant negative labour market gap between refugees and comparable migrants. Refugees are 11.6% less likely to have a job and 22.1% more likely to be unemployed than other migrants with similar characteristics. Moreover, their income, occupational quality, and labour market participation are also relatively weaker. Not only does this refugee-immigrant labour market gap not seem motivated by the different observable individual characteristics, but 60–80% of the ‘refugee gap’ (conditional on age, gender, and education) remains unexplained even when we control for unobservables using origin area, entry cohort, and destination country fixed effects, as well as interactions between them. The refugee gap is also relatively persistent over time. Figure 1 shows that, upon arrival in the host country, the employment probability gap is -30 percentage points, with a corresponding unemployment gap of 15 percentage points. Although this gap becomes progressively narrower with years of residence in the host country, the difference only reaches statistical insignificance after 15 years (for employment) or 9–10 years (for unemployment), suggesting that refugees struggle to eliminate their initial labour market disadvantage vis-à-vis other immigrants. Notes: The figure illustrates the evolution of the conditional gap in employment (panel A) and unemployment (panel B) probability between refugees and non-EU15 immigrants by years in the host country. All regressions include age, education, destination country–interview year fixed effects, and origin area fixed effects. The sample comprises non-EU15 immigrants and refugees aged 25–64. We also report 90% confidence intervals based on robust standard errors. Part of the difficulties faced by refugees trying to integrate into receiving societies are inherently associated with the forced nature of their migration.3 What happens next, however, is at least partially in the hands of host governments. Our analysis suggests that governments may indeed influence the speed and quality of refugee integration through their asylum policies. In particular, we focus on dispersal policies and on the degree of uncertainty in the refugee status recognition process. A relatively common scheme adopted by several European countries in recent years (Sweden, Denmark, Ireland, the Netherlands, Norway, the UK), are geographic dispersal policies for asylum seekers and refugees. These policies, which commonly require that individuals seeking humanitarian protection settle in specific locations across the receiving country, aim to prevent ethnic enclave formation by scattering refugees across the country and often away from larger cities. The effect of dispersal policies on refugees’ integration is theoretically ambiguous – if ethnic enclaves are detrimental to immigrant labour market integration, then dispersal policies may facilitate refugees’ economic success. However, they might prevent individuals from relying on co-nationals’ or relatives’ networks to find a job, and limit geographic mobility, reducing the chances of finding employment or good job matches.4 To identify the effect of dispersal policies on the refugee gap, we exploit variation in policy exposure across entry cohorts within the same country (i.e. comparing cohorts who arrived in a specific country before and after the introduction or termination of the dispersal policy) and within entry cohorts across countries (i.e. comparing the same arrival cohort across countries with and without active dispersal policies). In Figure 2, we display the gaps relative to other comparable migrants for refugees that were not subject to a dispersal policy (blue bars). We also show how the gap increases for those who arrived in the host country when a dispersal policy was in place (green bars). The latter group has a notably larger employment probability gap (-15 percentage points) with respect to comparable migrants than those not exposed to the policy (6 percentage points). 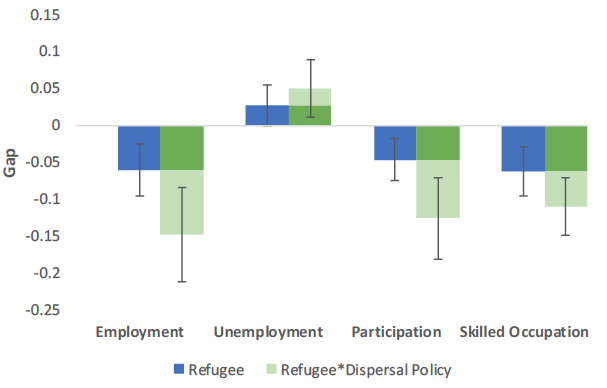 This negative dispersal policy effect on refugee outcomes is confirmed by the results for participation and the probability of being employed in a skilled occupation.5 Our results thus indicate that the detrimental effects of dispersal policies on the labour market performance of ‘dispersed’ asylum seekers seem to prevail over potentially positive effects. Notes: The figure illustrates the refugee-immigrant gaps in employment, unemployment, labour market participation, and probability of being in a skilled occupation. The sample comprises non-EU15 immigrants and refugees aged 25–64. The blue bars report the estimated coefficient on a refugee dummy while the light green bars report the estimated coefficient on the interaction of the refugee dummy with an indicator of a refugee dispersal policy being active in the destination country at the migrant’s time of arrival. For all estimated coefficients, 95% confidence interval are reported. Other included regressors are individual controls (gender, age, and education), host country–observation year interaction dummies, entry cohort—host country interaction dummies, and entry cohort-source area interaction dummies. We further show that the negative effects of being dispersed fade with time, as refugees start relocating within the host country. Indeed, among those who arrived within the previous five years or less, the employment gap between non-refugee migrants and dispersal policy-affected refugees is almost twice as large as that for unaffected refugees. For those who arrived from 6 to 14 years previously, however, this ratio decreases to about 1.5, and approaches zero for those who arrived 15 or more years previously. Thus, our results support the conjecture that the negative dispersal policy effect on labour market integration results from the suboptimal initial allocation of asylum seekers. Individuals seeking humanitarian protection face substantial uncertainty during the refugee status recognition process, and even subsequently if their claims are rejected outright or they are not granted permanent residence status. Longer asylum claim processing times or lower recognition rates of refugee status expose asylum applicants to prolonged uncertainty about their future in the host country, potentially harming their integration prospects. We investigate this aspect using official UNHCR records on refugee status determination to construct bilateral host country-area of origin specific measures of permanent status recognition rates and application processing times.6 We find that being exposed to relatively higher recognition rates reduces the refugee-immigrant labour market gaps. Arriving in a host country in a year characterised by a relatively high permanent status recognition rate would reduce the refugee gap in unemployment, shrinking it by 10-11 percentage points, and reducing the gap in employment by 5-7% (although the latter is not precisely estimated). The evidence on the effect of the decision rate is qualitatively similar, but statistically not significant. 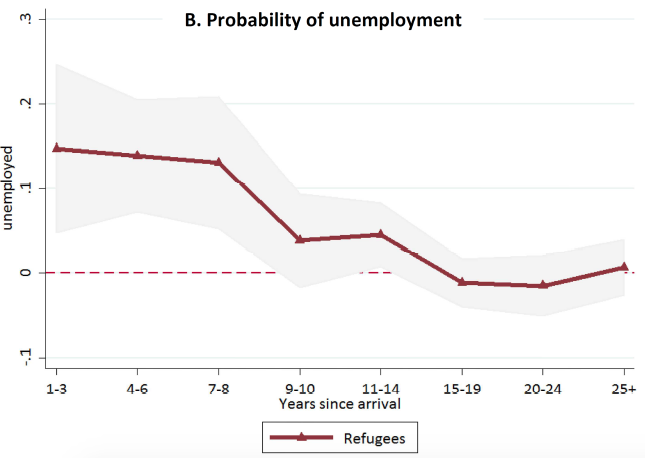 These findings suggest that reducing uncertainty for refugees may improve their labour market outcomes. Based on the evidence of past refugee waves in Europe, our findings suggest that a successful and fast economic integration of refugees in hosting societies is not an easy target to achieve. The fact that the current refugee crisis has been characterised by a sudden and vast inflow of individuals in a relatively short time span will probably add to the challenges with which host countries must deal. However, our analysis also shows that there is room for policymaking to make a difference. 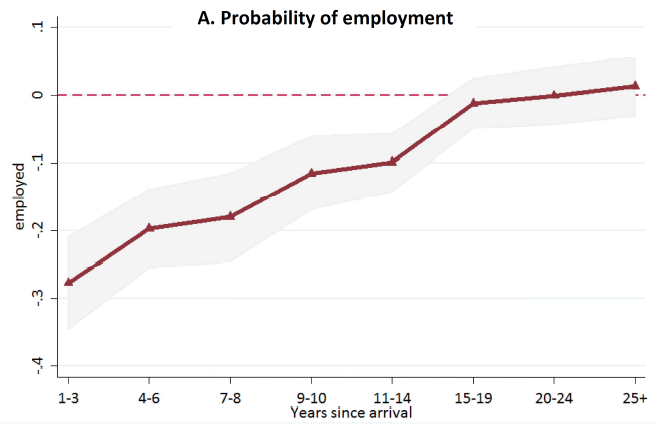 Indeed, we find that allowing free residential mobility to asylum seekers and reducing uncertainty during the refugee status determination process might improve their future labour market outcomes. There are important trade-offs that governments face when making decisions in this policy area. That is, whenever they aim to reduce immigrant inflows by making their policies more restrictive and their countries less attractive (for instance, by reducing recognition rates of asylum applications), they also tend to affect existing stocks of immigrants and/or refugees, potentially harming their future prospects for socio-economic integration. At the same time, short-term political considerations may induce policymakers to favour measures that minimise immediate costs rather than maximising long-run benefits, leading to potential underinvestment in refugee integration. Hence, an additional challenge posed by the current refugee crisis is how to overcome myopia in designing European asylum policy. Bevelander, P and P Ravi (2014), “The labour market integration of refugee and family reunion immigrants: a comparison of outcomes in Canada and Sweden”, Journal of Ethnic and Migration Studies 40(5): 689–709. Bratsberg, B, O Raaum and K Roed (2014), “Immigrants, labour market performance and social insurance”, Economic Journal 24(580): 644–683. Cortes, K E (2004), “Are refugees different from economic immigrants? Some empirical evidence on the heterogeneity of immigrant groups in the United States”, Review of Economics and Statistics 86(2): 465–480. Dustmann, C, F Fasani, T Frattini, L Minale and U Schönberg (2017), “On the economics and politics of refugee migration”, Economic Policy 32(91): 497–550. Fasani, F, T Frattini and L Minale (2018), “(The struggle for) refugee integration into the labour market: Evidence from Europe”, CEPR Discussion Paper 12718. Fernández-Huertas Moraga, J and H Rapoport (2015), “Tradable refugee-admission quotas and EU asylum policy” CESifo Economic Studies 61: 638–72. Hatton, T J (2017), “Refugees and asylum seekers, the crisis in Europe and the future of policy”, Economic Policy 32(91): 447–496. This article is part of a broader research project on refugee migration in Europe funded by Nuffield Foundation. See here for further information. For example, exposure to conflict, traumatic experiences and unplanned migrations all generate important hurdles and undesirable legacies that prevent asylum seekers from making a successful start upon arrival. In addition, refugees are often allocated to relatively disadvantaged areas, where accommodation is cheaper but labour demand is weaker. For unemployment, the additional effect of DP is not statistically significant. Recognition rates are computed as the ratio of the number of applicants granted refugee status to the total number of decisions reached every year. Application processing times are instead proxied with the ratio of the number of decisions (positive and negative) reached every year to the number of pending applications plus the new applications submitted during the year.